Cats running loose in the neighborhood present a dilemma for residents who feel sorry for the wild animals but at the same time need order in their communities. Feral or lost cats can procreate at alarming rates when left on their own, leading to necessary capture and eventual death in many cases. Trap, Neuter, Vaccinate and Return (TNVR), instituted by the City of Fort Pierce, has changed all that. The program is saving lives and taxpayers’ money while limiting the numbers of cats struggling with life on the streets. 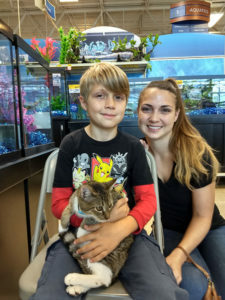 TNVR has been implemented by hundreds of communities in Florida, including Jacksonville and West Palm Beach, which recognized that more than 70 percent of cats picked up and taken to shelters are killed. 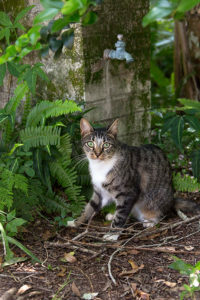 The Treasure Coast had been behind in coping with free-roaming cats in a humane way until April 2017 when Fort Pierce passed an ordinance allowing TNVR within the city limits. “Catch and kill doesn’t work because it leaves a vacuum to be filled by other cats,” says Susan Parry of the Parry Foundation, a local charity that donated $10,000 to the city to launch TNVR. The program utilizes volunteers from three animal welfare groups that assist at no cost. Stray and feral cats in the community are trapped, spayed or neutered, vaccinated and returned to their locations with ear-tips to identify they have been treated. Population growth stops and mating behavior is limited. What about the adorable kittens? Many are placed in foster homes for adoption. “You have volunteers doing the work with a compassionate approach that is more cost effective,” adds Parry. Now, residents can contact United4Animals, Operation CatSnip and the Community Cat Coalition to request TNVR when they notice abandoned or wild cats within city limits. A previous ordinance prohibited feeding outside cats with the threat of a citation. Cat lovers caring for lost or abandoned pet cats and wild-natured feral cats kept their activities under the radar, concerned about the virtual certainty of euthanasia for captured animals. As a result, many cats were not caught and continued to breed. With TNVR, residents are comfortable contacting the volunteers who transport the cats to participating veterinarians: Operation SOS, Dr. Dan’s Animal Hospital and Animal Medical Hospital. The city saves money at the same time, paying $50 surgery fees for a male and $55 for females, including rabies shot and microchip, funded through animal tag and registration revenues. That’s about 60 percent less than the $130 per animal for sheltering at the Humane Society. The city’s decision to approve TNVR was not made without due consideration. Peggy Arraiz, code compliance manager, conducted extensive research on the pros and cons. Communities that do not support TNVR express concerns because cats typically receive only one rabies vaccination at the time of treatment and are then released to life outside, where they are exposed to infected wild animals and where they hunt birds. Citing public health risks, Indian River County’s health department is still seeking humane solutions. Last November, Arraiz presented the results of the Fort Pierce Community Cat program to the mayor and commissioners. Since it started, 700 cats were treated: 376 females, 324 males. Estimating that an unspayed female can have two litters of five kittens a year, more than 3,000 kittens were not born to roam throughout the community. 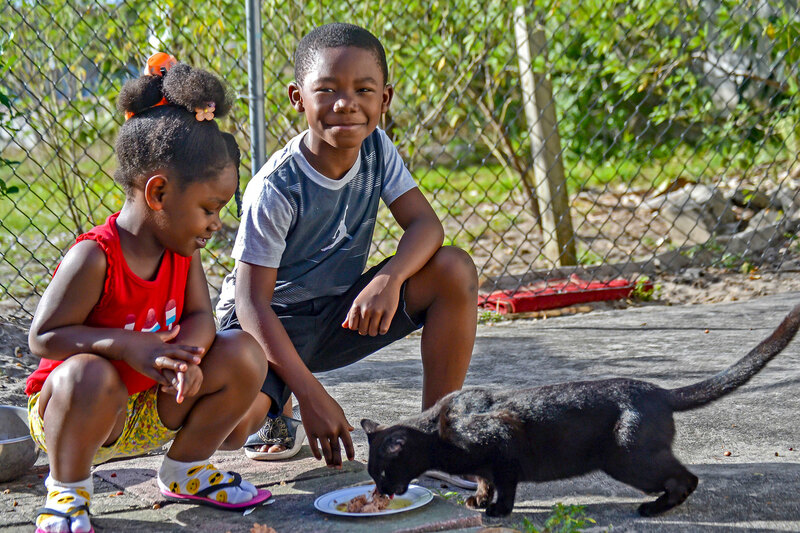 According to statistics from the national organization Alley Cat Allies, the City of Fort Pierce needs to spay or neuter 821 cats to achieve zero population growth, limiting births to only the level needed to replace the existing population. It’s anticipated that number will be reached by early 2019. Zero population growth means fewer and fewer free-roaming cats. As a result, regions with a long track record in TNVR, such as Orange County, report a decrease in complaints to animal control. At the November meeting, Steven Wilkie, representing the Stuart-based non-profit Second Life Animal Sanctuary, presented the commission with a $3,000 donation. “We are supporting Fort Pierce because of your foresight and support of TNVR, the only workable solution to community cats. From an environmental standpoint, it keeps the number down and takes the pressure off the shelters,” he told commissioners. One of the volunteer-based groups, Operation CatSnip, has coordinated with TNVR for years, sterilizing 40 cats near St. Lucie Boulevard and U.S. 1 and rescuing 32 kittens. Only two cats remain. “The volunteer groups need foster homes for kittens and we encourage anyone interested to contact us,” says Sharon Cooper, director of Operation CatSnip, which has coordinated sterilization of more than 400 cats through the Community Cat program, as well as low-cost sterilization for pets. Fort Pierce resident Robbi Black is one of the group’s experienced trappers. Gracee is an adorable kitten who would have been euthanized under the old system due to a bad eye infection. Instead she received care and safe eye removal surgery. It was tough going for several months, but she has been adopted by a loving family. Word of the program’s success is spreading. Code enforcement staff members are getting inquiries from counties and cities, and a TNVR ordinance was passed in Martin County. “Now we need St. Lucie County to institute the program,” adds Parry, who offered a Parry Foundation start-up grant to the St. Lucie County Commission in November. Michelle Abaldo is an Operation CatSnip volunteer.